Comments Off on Katharina Scheiter visits CrossWorlds! 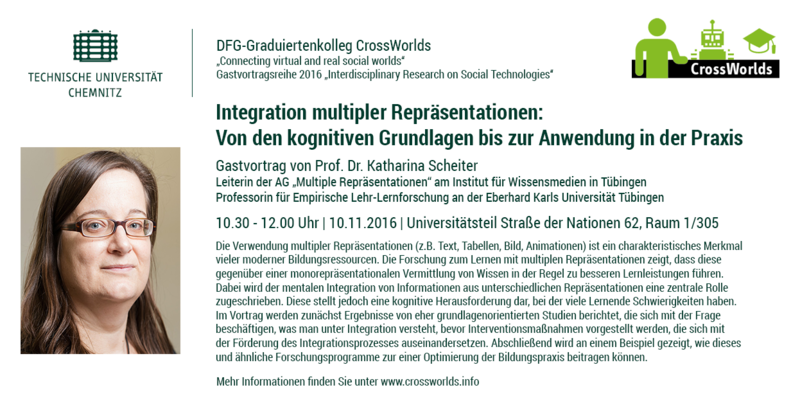 CrossWorlds proudly announces the visit of an outstanding expert in multimedia research: At November 10th, Prof. Dr. Katharina Scheiter from the Institute of Knowledge Media and the Eberhard Karls University Tübingen visits Chemnitz and introduces her research in learning from multiple representations of knowledge. 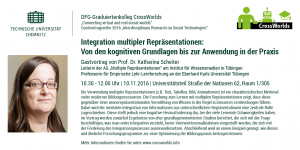 Her talk entitled “Integration multipler Repräsentationen: Von den kognitiven Grundlagen bis zur Anwendung in der Praxis” will deal with basic research on knowledge integration as well as its application in educational interventions and is scheduled from 10.30 a.m. to 12 in room 1/305 (main building Straße der Nationen 62). We are looking forward to welcome a broad audience and engage in lively discussions! With over 100 researchers from various countries, the 14th International Conference on Cognitive Modeling (ICCM) was held at the amazing campus of PennState University from August 4th to 6th. 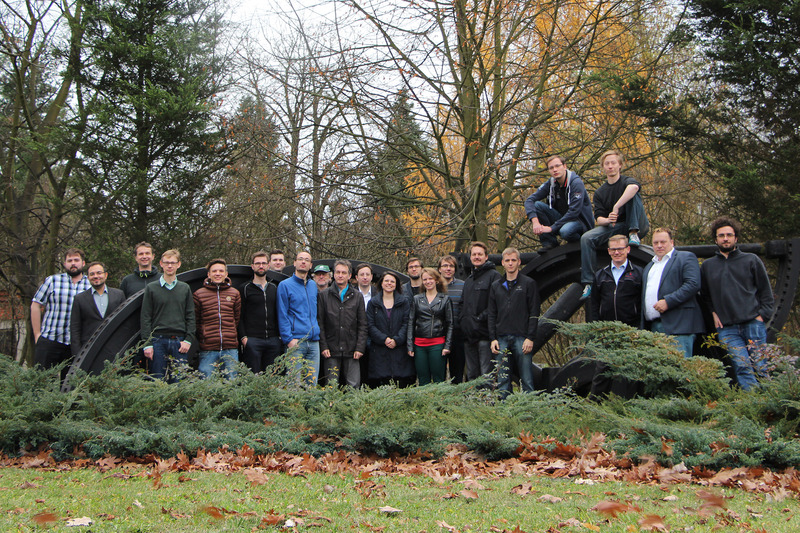 Besides a schedule enriched with sophisticated keynotes and talks on various theoretical and methodological issues related to modeling and simulating human cognition, the organizers arranged an exciting social program including a mentoring lunch at the first day and a barbecue with sports activities like go-cart, baseball or golf in the evening of the second day. 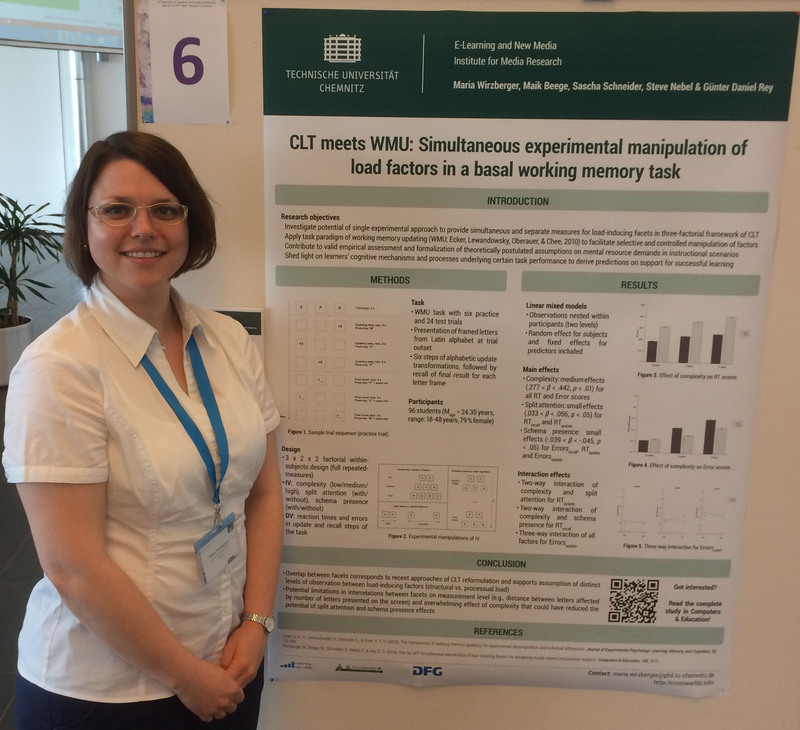 In particular the poster sessions at the first and last conference day offered various opportunities for lively discussions. Related to this point in schedule, the organizers had invented a new format called “poster boaster”, a short session in which each presenter had to “advertise” his or her poster in advance, to arouse peoples’ curiosity in the presented work. 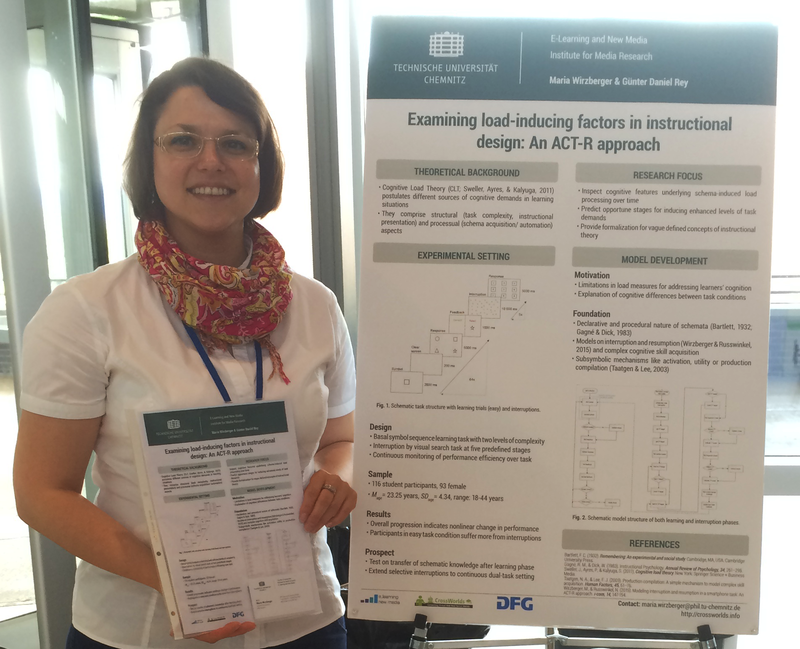 Right within the first poster session, CrossWorlds researcher Maria Wirzberger introduced her project entitled “Examining load-inducing factors in instructional design: An ACT-R approach”, gained rich feedback on her model concept and could discuss current construction yards with experts from the community. Moreover, she had the opportunity to become aquainted with fellow researchers from all over the world and got surprising insights into the American way of life! 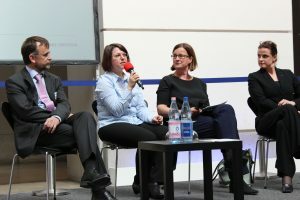 On the occasion of the 6th Day of Teaching at the TU Berlin at June 27th, our colleague Maria Wirzberger was invited to join a panel discussion on “Employability due to business cooperation”. 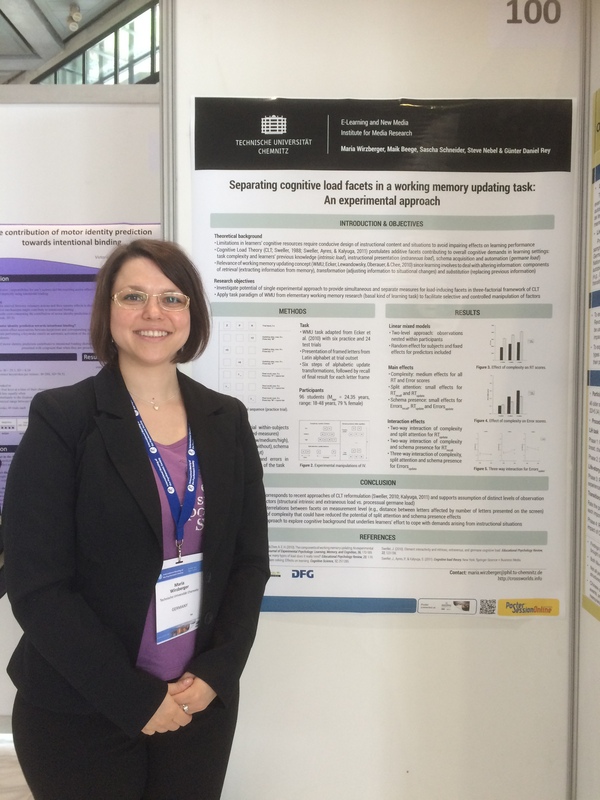 Being an alumna of both the university and the Germany scholarship programme, she took a student perspective and shared her own experiences from an interdisciplinary student project with a business partner as part of her master’s degree course. Moreover, she gave insights into the accompanying career-related programme from her scholarship sponsor IBM Germany. Maria especially outlined the arising benefits for her own career and thus emphasized the necessity of such opportunities for students. 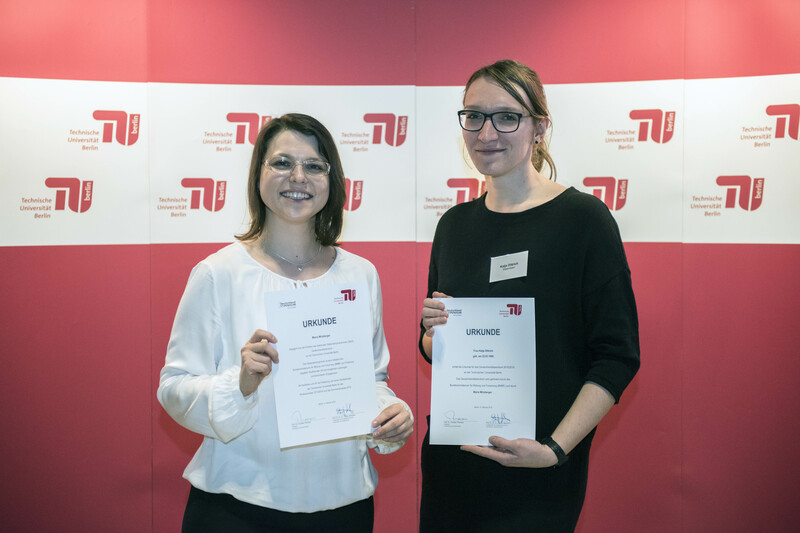 On the occasion of the Germany scholarship celebration 2015/2016 at the TU Berlin, CrossWorlds researcher Maria Wirzberger, formerly scholar and now sponsor within the scholarship program, got together with her current scholar Katja Dittrich and handed over the scholarship certificate. Being a graduate of the Human Factors master’s degree course, Maria Wirzberger dedicated her scholarship to a student enrolled in this course of studies. The Germany scholarship program is intended to promote highly talented and socially involved students by monetary and career-related support. It receives funding in equal parts from the Federal Ministry of Education and Research (BMBF) as well as private sponsors (companies, foundations or private individuals). To consolidate their dissertation topics and further develop existing cooperation ideas, members of the current group of CrossWorlds researchers and their supervisors met in conclave at the IBS (international centre of computer science and encounters) in Lauta-Laubusch from November 9th to 10th. Topics and ideas were first discussed vividly in plenum, and afterwards refined in interdisciplinary study groups. Prospective cooperation projects deal for instance with joint educational and linguistic multi-user settings at shared haptic devices, moral dilemmas in virtual reality or novel applications of facial recognition parameters. Altogether, we spent two busy days filled with intense conversations and focussed work that really brought forward our ideas! On October 12th, Mr. Aaron Marcus visited CrossWorlds and gave a talk on “Mobile Persuasion Design”. He presented his perspective and experience on the theories and practice of User Centered Design, Experience Design, the Science of Persuasion, and the merging of these developments in current and future applications for phones, tablets and wearables. Thereby, he gave insight in some of the work he performed during his long and successful career: Mr. Marcus is President of Aaron Marcus and Associates, Inc. (AM+A), in Berkeley, California, and an internationally known expert in Mobile User-Experience Design, Mobile Persuasion Design, Information Design, Visualization and Cross-Cultural Design. In a subsequent workshop, we presented our own projects to Mr. Marcus and got some very valuable feedback.